성풍사터에 서 있는 탑으로, 전체의 무게를 받쳐주는 기단(基壇)을 2단으로 두고, 5층의 탑신(塔身)을 쌓아 올렸다. 기단은 각 층 모두 네 면의 모서리와 가운데에 기둥 모양을 도드라지게 새겨 놓았다. 탑신은 각 층의 몸돌과 지붕돌을 각각 하나의 돌로 새겨 쌓아 올렸으며, 몸돌의 모서리마다 건물의 기둥을 세운 듯 기둥 모양을 본떠 새겨 놓았다. 지붕돌은 얇으며, 밑면의 받침이 3층까지는 4단이고, 4·5층은 3단으로 줄어들어 일정하지 않다. 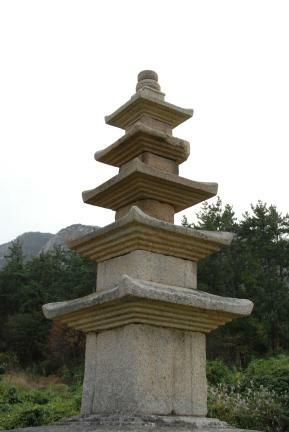 처마의 네 귀퉁이는 아래에서 올려볼 때 뾰족하게 보일만큼 날카롭게 솟아있다. 꼭대기의 머리장식으로는 노반과 복발만이 남아있다. 탑안에서 발견된 유물을 통해 고려 목종 12년(1009)에 이 탑을 세웠음을 알 수 있다. 예전에는 이 터에서 무너진 채 있었는데, 1986년 3층의 지붕돌과 5층의 몸돌, 지붕돌을 새로 만들어 복원해 놓았다. 석탑은 그 만든 시기를 확실히 알 수 있는 것이 드문데, 이 탑은 기록을 통해 정확한 연대를 알 수 있고 또 거의 완전하게 복원된 작품이다. 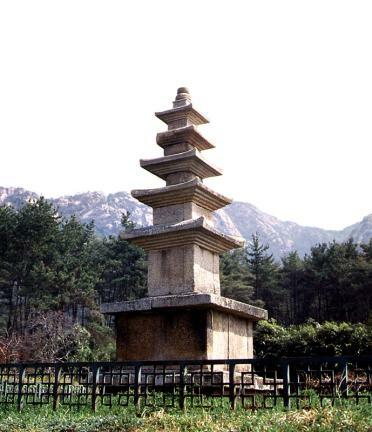 This five-story pagoda, standing on the former site of Seongpungsa Temple, consists of a two-story platform and a five-story body. 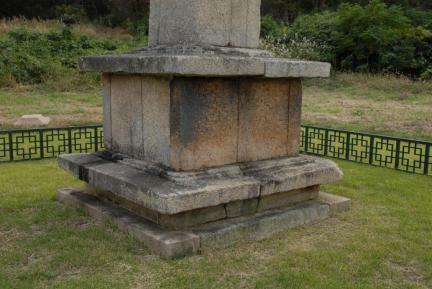 Pillar designs are carved on the corners and the middle of the four sides on each platform. 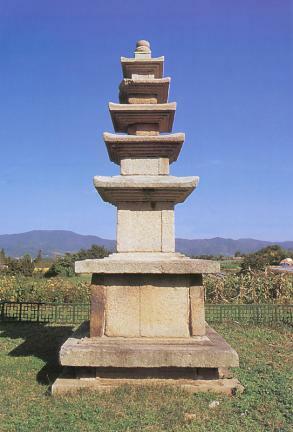 The pagoda body was set up by piling up stories, with every roofstone and body each made of a single piece of stone. The body of every story has carvings of pillar design at the corners, as if actual pillars support the roofstones. 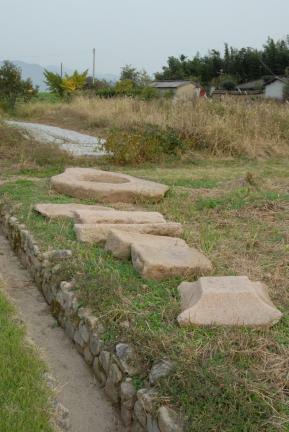 Each roofstone, made of thin stone plates, is propped by four-story supports up to the third story and by three-story supports on the fourth and fifth stories. The eaves have four-pointed corners stretching upward. Only the base of the finial ornaments and a semi-spherical ornament at the lower section of the finial remain today. 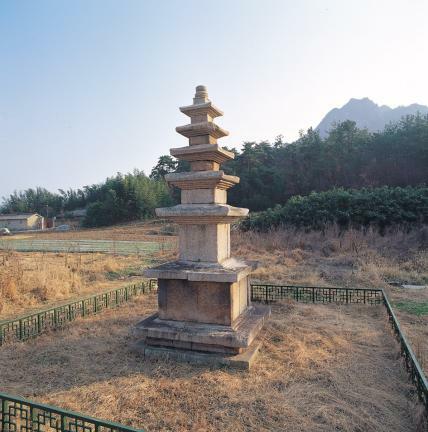 Based on the artifacts discovered inside this pagoda, it was first established in 1009 (12th year of the reign of King Mokjong of the Goryeo Dynasty). It remained in collapsed state until its restoration in 1986. 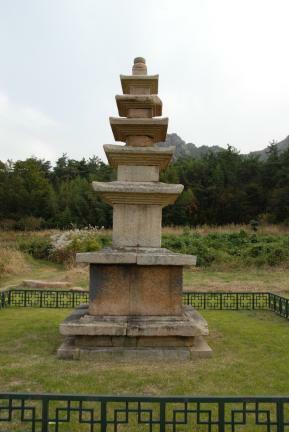 Usually, very few stone pagodas have a record as to when it was built; note, however, that this pagoda has a record that enables finding out exactly when it was built, and it was also restored perfectly.